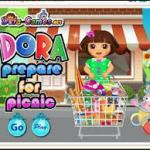 Dora Prepares For Picnic is a free game for girl to play online at friv4school.me! Dora Prepares For Picnic: Dora is planning a picnic to a park. Help Dora Prepare For Her Picnic! She needs to prepare everything: sandwich, juice, oranges, umbrella... Let’s go the supermarket with her and choose the right things. Enjoy this fun game!